Federal Reserve Chairwoman Janet Yellen testified in front of the Senate Banking Committee this morning regarding the Fed’s economic outlook, accompanying their semi-annual monetary policy report. She hinted that the positive data coming from the labor market has surprised the Federal Open Market Committee, and may lead them to raise interest rates higher and sooner than they were planning. However, she stressed that “considerable uncertainty” surrounds the Fed’s economic outlook, and any decisions on interest rates will have to depend on future data. The policy report also hinted that biotech and social media stocks, which are highly popular right now, may be currently stretched in value. The S&P 500 Index has fallen by 0.19% so far in the trading day. Most Fed officials expect the Fed to raise interest rates a year from now, and suggest they stay close to zero for a “considerable period” after the Fed ends its QE3 stimulus program this October. Other economists and Fed regional bank presidents are pushing for sooner action, citing a sharp drop in the unemployment rate (now 6.1%) over the past year and inflation growing higher over the past few months. Forbes described the statements as mostly neutral for gold, but its price dropped anyway, going below $1,300 for the first time since June 19. “I would say it (the testimony) is neutral. 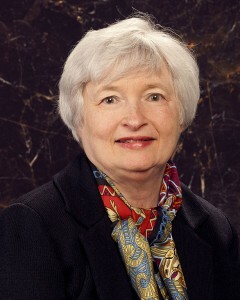 She mostly kept to the script, although she did leave the door open a bit for a move (rate hike) sooner than expected. But I think that was part of her usual most skillful performance on Capitol Hill,” said Bill O’Neill, a principal with LOGIC Advisors. Other factors are being blamed, such as gold investors selling and capitalizing on gold’s recent gains as well as reactions to outside markets like India.